Comment: At day, and in most mixed light settings, this alexandrite sparkles in such vivid green that it might be considered a vanadium chrysoberyl, but it is not known (thus far, inquiries are under way) if chrysoberyl can be blessed with vanadium AND qualify as an alexandrite. The IGI report attests to its fine color quality (in writing and with a realistic day-photo) and to its rare country of origin: Russia. It has been said that Russian alexandrites are mined out and available only from estate sales, but I did come across some sources reporting irregular finds of new gems. Such, I think, is this 1.00, lens-clean, no window, no treatment (3*Nos). Like in all alex, the color-change is a tough show on images, but particularly here where the day-hue comes in such an extremely strong green, yet I have succeeded to capture the ochre-red at night, with and without green sparks. 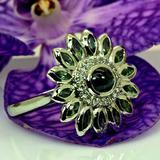 However, the night color is elusive while the green easily reminds of fine emerald or demantoid, seriously, and thus avoids the often-muddy appearance of alexandrites in mixed light-settings. On the other hand, it needs pure tungsten light to optimize the mild night color. Even a ray of daylight brings out its green. Also, under 'more images', see an outlier-shot where LED-light turned the gem sky-blue! The fine crystal, clear, clean and crisp, makes for an equally rare occurrence in alexandrite. 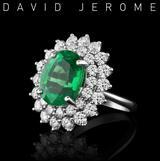 At its price-level and extreme rarity, this is a serious collector stone, though the vivid green brilliancy makes it a less complicated gem for jewelry than most alexandrites. Please ask if this is not clear. Probably best set in a ring to better observe the color-change and the amazingly beautiful green (though I realize, this could be said of any gem under ten carat).